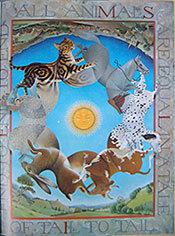 Masquerade by Kit Williams is an illustrated children′s fantasy puzzle book. 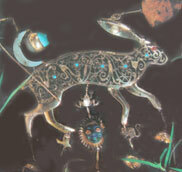 Originally published in August 1979, the book contains clues within its illustrations as to the whereabouts of a small gold and jewelled amulet hare (worth £5,000 or $8,225 at the time - a decent but not excessive prize for 30 years ago) that had been buried somewhere in the United Kingdom. In an era before search engines, the idea of a search for real buried treasure turned the book into a worldwide bestseller. 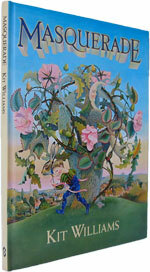 Not only did Williams′ illustrations hold the key to buried treasure, they are beautiful and intriguing depictions of English wildlife accompanied by a captivating storyline. The moon falls in love with the sun and wants to give him a token of her affection, and sends Jack Hare as her courier. Masquerade describes his journey to deliver the moon′s amulet to the sun. But somewhere along the way Jack Hare drops the amulet and the reader must unravel the clues to find the buried treasure. The puzzle was not easy to crack. In fact, it′s still completely baffling, although the location of the golden hare was widely reported and can be discovered in seconds with a Google search. Thirty years ago, readers formed teams to help each other map their way through the book′s dead ends and red herrings. The buzz about Masquerade spread across the world attracting many treasure-hunting visitors to the UK. Three years after the book′s publication, the hare was found but under controversial circumstances. 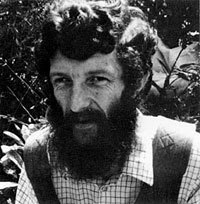 A man who identified himself as Ken Thomas discovered the loot but it was later found he had given a false name and was called Dugald Thompson - he was the business partner of a man who was the then-boyfriend of Kit Williams′ ex-girlfriend (whom the artist had been dating when developing the treasure hunt scheme). Thompson/Thomas sold the hare in 1988 at auction for £31,900 ($52,480) to an anonymous overseas bidder and that was the end of the Masquerade story ...until the middle of July 2009 when BBC Radio 4 broadcasted a show to mark the 30th anniversary of Masquerade′s publication and Williams gave his first interview in years. The media coverage renewed interest in Masquerade and it became the bestselling book on AbeBooks.co.uk for the week of 13-19 July. Until earlier this week, I had never heard of Masquerade. A quick search on AbeBooks revealed one of our local Canadian booksellers in Victoria, BC, Limebay Books who are located about a mile from our office, had a copy so within 40 minutes I was able to see the illustrations myself. Our copy is a US edition published by Schocken Books - a fifth printing from 1981. On the inside cover of the dust jacket, a sticker has been placed, declaring that the golden amulet has been found. Masquerade is an enthralling picture book, filled with fantastic detailed images of animals and people in a variety of mostly rural settings. From the first page, where mice are playing in the grass below the fields of a farm house with the moon sitting solemnly in the sky looking down, you feel you are entering a slightly different world. A couple of pages later a young girl in a tutu is holding a dandelion and floating through the sky with a crow perched on her outstretched arm. Below the girl is a picturesque town with a church and a soccer pitch bearing a series of numbers. Each illustration is bordered by text. I tried to put myself in the mind of a treasure hunter in 1979 reading the book for the first time. Frankly, I had absolutely no clue where to start solving the mystery. No pattern or even semblance of a puzzle appears from the pages. Part of the book′s appeal is that the puzzle really doesn′t matter. Masquerade is a beautiful and haunting illustrated book without the reader having to trek around the UK with a metal detector and spade looking for a small golden hare that might have been buried under a haystack. The 1979 editions of Masquerade are rather hard to locate but second-hand later editions of the book are plentiful and affordable. Can you crack the code of Kit Williams′ Masquerade? What's your most prized children's book?